Transitional epithelium. Atlas of Plant and Animal Histology. The image is from urinary bladder. Organ: urinary bladder, transitional epithelium. It was thought that transitional epithelium was an intermediate type of epithelium, a “transition”, between the stratified squamous epithelium and the stratified columnar epithelium. That is why the name transitional. But it is not. 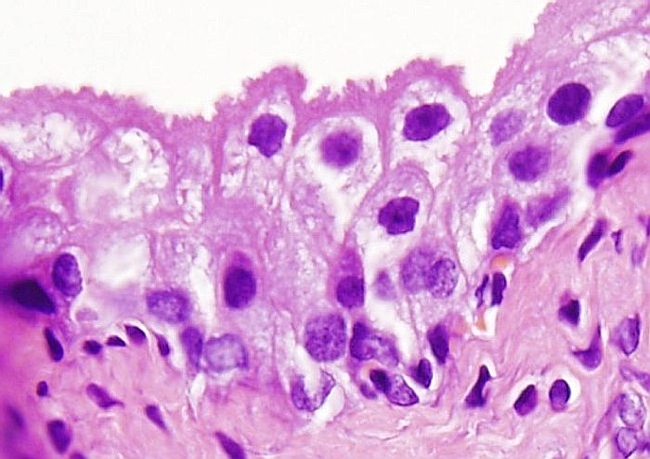 Transitional epithelium is a stratified epithelium with a variable number of cell layers (2 to 6), which are irregular in thickness and in the position of the nuclei. 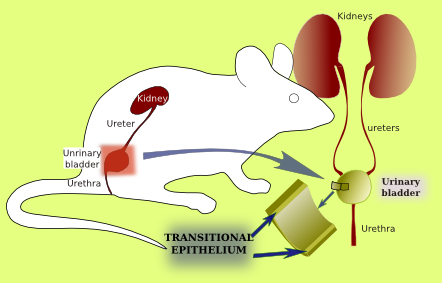 The transitional epithelium is also called urothelium because it lines urinary ducts, such as renal calyces (2 cell layers), ureters (3 to 5 cell layers) urethra (4 to 5 cell layers) and urinary bladder (up to 6 cell layers). It is not very permeable to salts and water, and it acts as an osmotic barrier between the urine and tissues. One of the main features of transitional epithelium is its ability to be stretched and recover the original form. For example, during the filling or emptying of urinary bladder. It can be observed that cells of the upper layer are sometimes flattened (stretched) and sometimes rounded (relaxed). 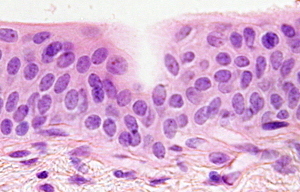 These cells show a thicker apical part, which is known as plate. Plates are responsible of the rough surface of the transitional epithelium when urinary bladder is empty, as it can be observed in the upper of the two images above. Some of the cells of the upper layer are binucleated (small image on the right) and most of them contain polyploid nuclei. Furthermore, they send cell processes that contact with the basal lamina. 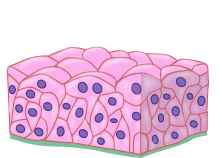 In the basal layers, cells are smaller and more abundant, but they enlarge in size as they travel toward the upper layer. There are no interdigitations with the connective tissue, as it can be observed in other type of stratified epithelia, and the basal lamina is flat. 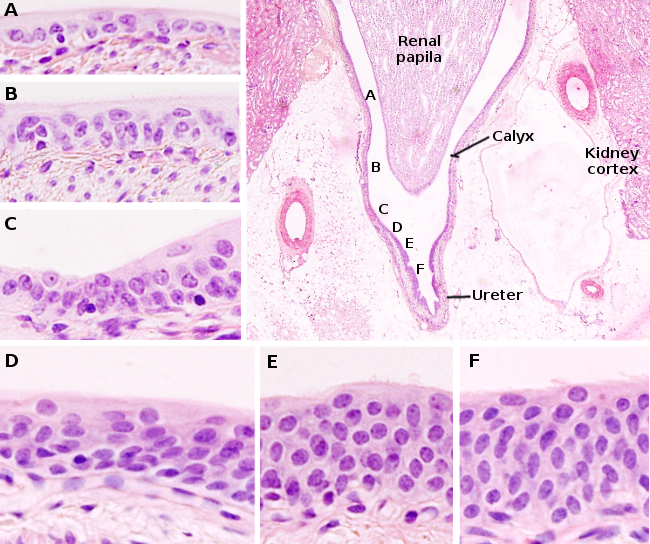 Increase in the number of layers of the transitional epithelium as we move from the kidney calyx toward the ureter.